First off, thanks for all the sweetness on the last post. And the winner of the lovely yellow neckwarmer is... Toni! Email your mailing address to jgeigley [at!] gmail.com and I'll get it sent off to you ASAP. And now a little Kansas City re-cap. Bo and I drove down for a date-night concert. 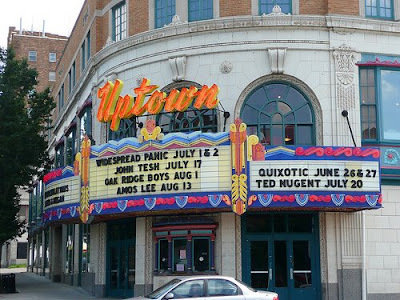 The venue was KC's Uptown Theater. Which is totally gorgeous inside. 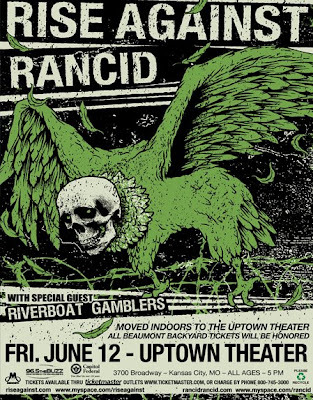 We weren't huge fans of Rise Against but Rancid was fast and hard and loud and perfect. They could do no wrong. They played so many of our faves and could have played all night. We had to hit up a local Vespa shop that we happened to drive right past. Which was near this great graffiti wall. (I loved the Star Wars dudes. You can't see Chewie or R2D2 here but they were rad.) And of course, we stopped at the Plaza so I could take a quick look around Anthro, U.O's, Paper Source and a few other stores. We also stayed at the same hotel as Great White. We think. This would be based solely on the fact that we saw a brochure for a Great White show in the hotel lobby. 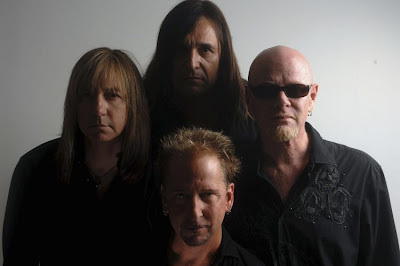 It's very hard to tell for sure, because if you look up band photos, you'll find that the lineup has changed twenty times since the 80s. But we're pretty sure it was them. We crossed paths with a blonde rocker (maybe Michael Lardie) and his blonde wifey/girlfriend three times in the hallway. We saw the whole band in the lobby checking in. And again the next morning at the complimentary breakfast. Where we started making jokes about the danishes looking once bitten, twice shy. So that was fun. And now we're back home with this little cutie. Who's been rocking this t-shirt so nicely. 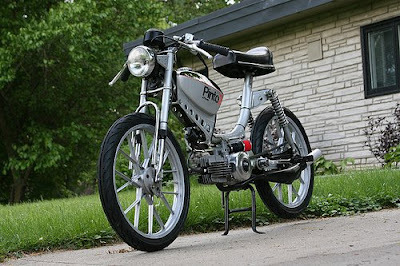 In moped/scooter news, Bo finally got the '78 Kromag Pinto2 running. So we've been driving our neighbors crazy by riding it through the back yard. Actually, it's just me that rides it in the back yard. Because I don't have a motorcycle license. haha you look so cute riding that! 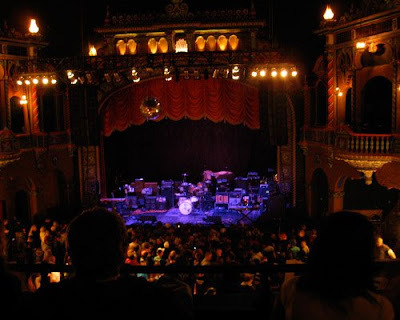 and that's funny that the pic of the venue shows WSP. I love them! 3 more dayS! Oh yeah!! actually it's 2 more days, but really, who's counting??? Cool pics!! Love your girl in the AC/DC shirt, very cool! Girl, I just love you! YOu are even more gorgeous and cool in person!! I am so glad we got to kick it! I hope we get to again soon! I swear I know how to spell! And look Big Dinners was already here today-HA! !